Happy weekend. Are you on the east coast of the USA? If so, are you melting? 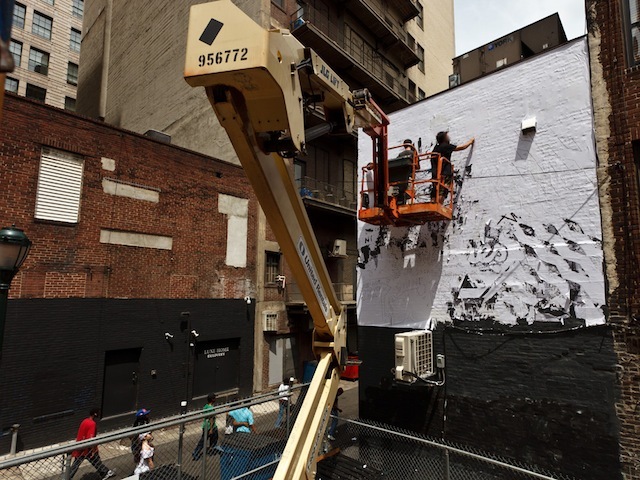 Vandalog blogger Rhiannon Platt will be speaking today in NYC at All City Canvas’ event. ACC also has a series of online discussions coming up. 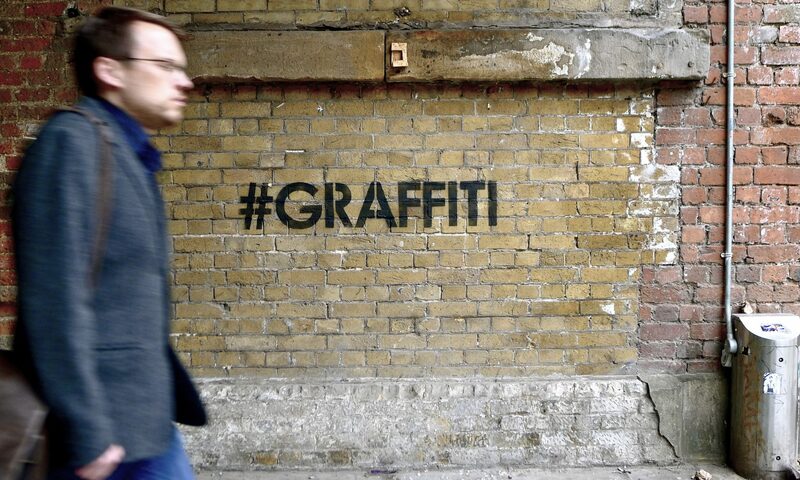 Good for a laugh: 14 street art terms defined and illustrated. 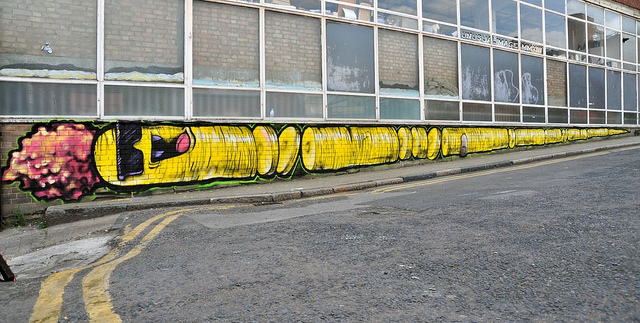 Alexis Diaz painted a mural just off of Brick Lane in London. 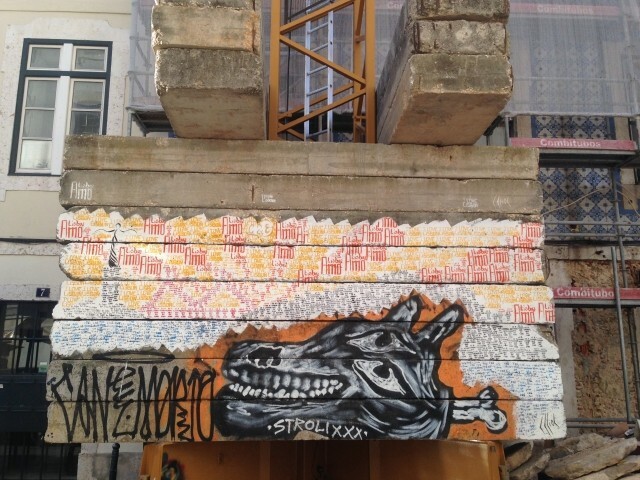 Vhils was hard at work this week in Portugal. Nice One shows street artists that you can still do a great character without permission from the property owner (I assume given the other tags and half-finished scribbles on the wall). Known Gallery will be showing both Cept and Remio later this month. I’m not sold on Remio’s indoor work, but his graffiti is definitely up there, and I’ve been a huge fan of Cept for year. I’m glad to see Cept getting some real recognition in the USA. Isaac Cordal’s latest show looks intense. I’ve always thought that if I knew how to drive and own a car, I would have an artist paint it. Well, Kenny Scharf has been painting cars for fans lately and posting the pics on Instagram. I love the retro-looking results. 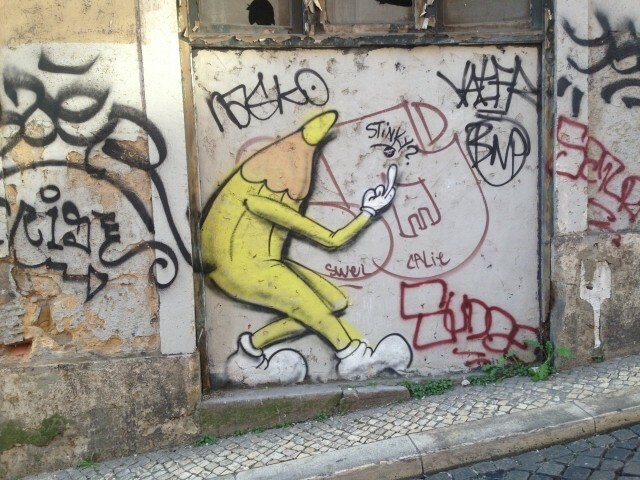 Plenty of photos of EKG’s ubiquitous tag along with an essay by the mysterious artist. Herbert Baglione paints an abandoned hospital. Before this, I would have been content to never see a new flag painting by Saber. He’s an amazingly skillful painter, but I was a bit tired of the theme. And then he made wooden pieces and I changed my mind. 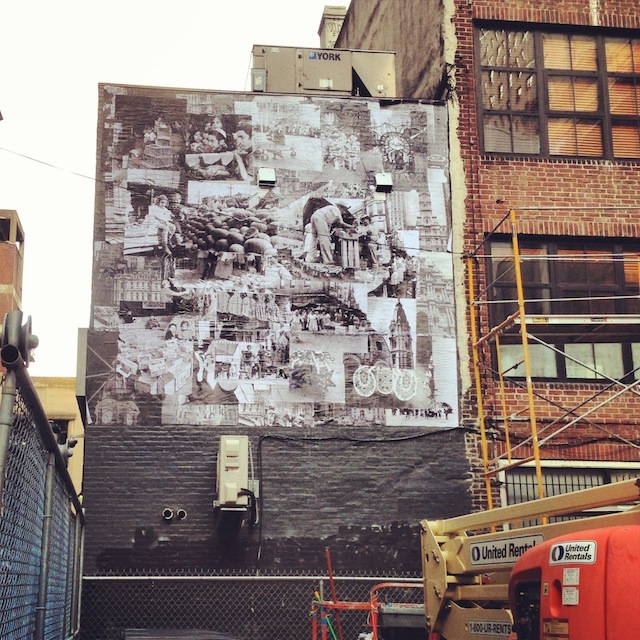 This summer I’ve been interning at The City of Philadelphia Mural Arts Program. The program is a city-run organization that has installed thousands of murals in Philadelphia over the last 30 years. 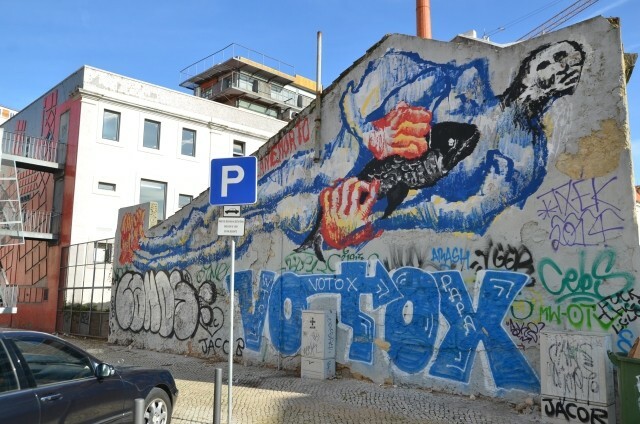 Most of the artists they work with are traditional muralists, but they have also worked with Kenny Scharf, Steve Powers and others from the street art and graffiti scenes. 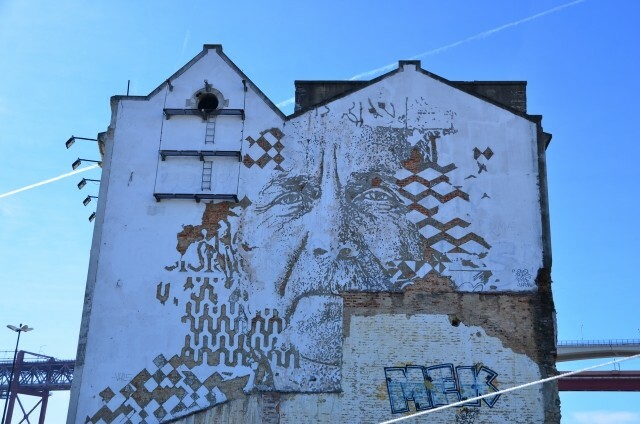 Last week, Vhils came to town and installed a wheatpasted mural similar to the piece he did outside of the Leake Street Tunnel a few years ago in London. 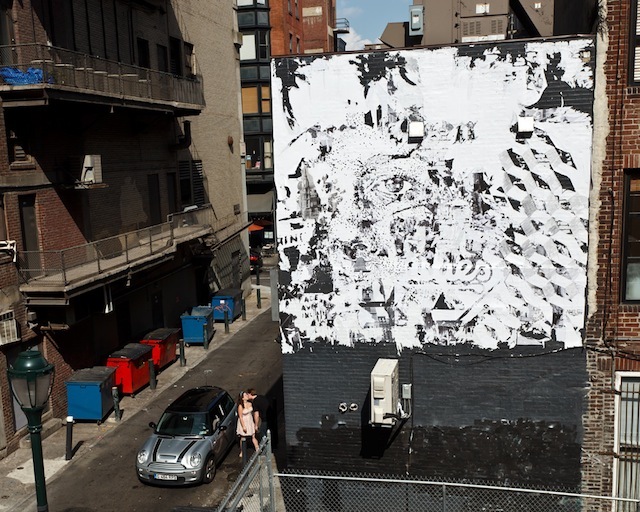 Rather than starting with a layer of old advertisements like he usually does, Vhils began the mural with a layer of collaged historic photographs of Philadelphia and covered that with a layer of white paper. The mural is on Drury Street in Center City, around the corner from the murals by Kenny Scharf, Gaia, and How&Nosm on 13th Street. 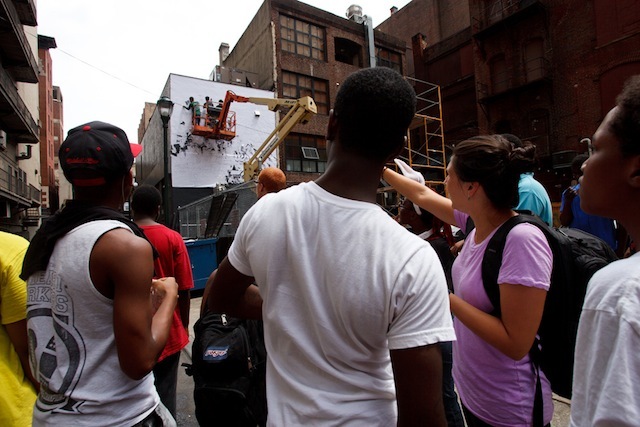 An art class from Mural Arts visits Vhils on site. Photo by Steve Weinik. The first layer of the mural. Photo by RJ Rushmore. 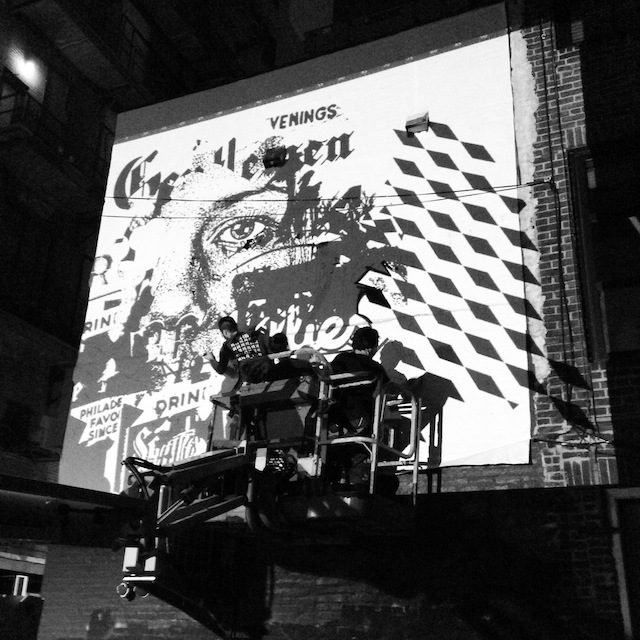 Vhils and his crew projecting on the wall. Photo by Lisa Murch. Click to view large. Photo by Steve Weinik. Longtime readers will know that I am a big fan of Very Nearly Almost, a British art magazine for street art, graffiti, illustration and the like. Their latest issue has been a very welcome reprieve for me as I’ve turned to it in between writing essays upon essays for my final exams. 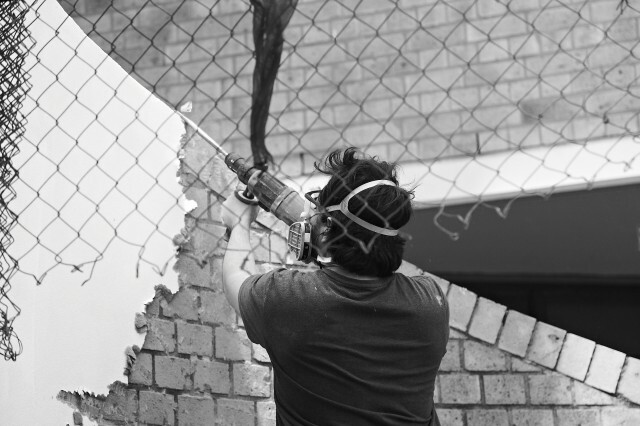 Issue 22 features interviews with Vhils, Vexta, Cranio, Moneyless, Husk Mit Navn and more. The Vhils and Husk Mit Navn interviews in particular make this issue worth seeking out. 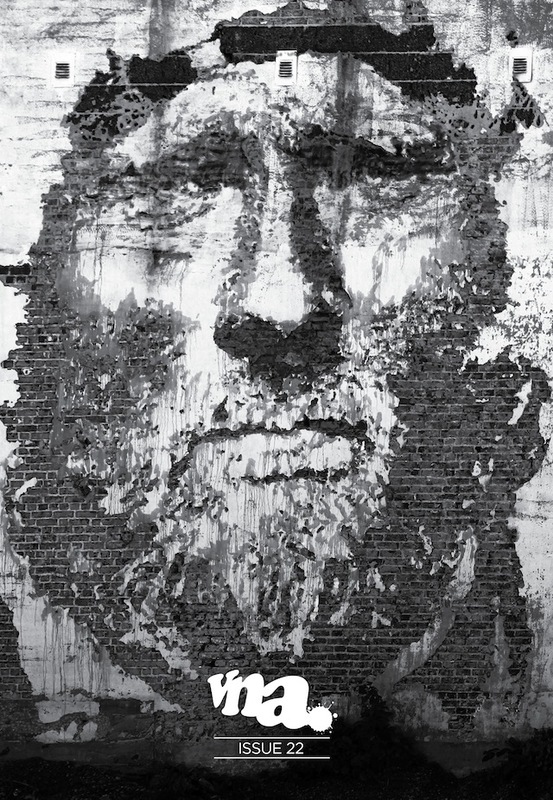 Vhils talks about his early career as a graffiti writer and suggests that he’s still active today, although the work isn’t traceable back to his career as a fine artist or muralist. 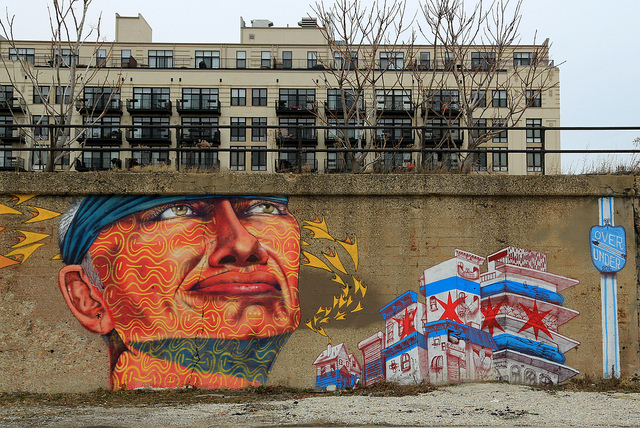 This certainly isn’t unheard of for street artists who have “gone legit,” but it’s still a bit surprising to hear him talk about it, and about how graffiti still informs his work today. 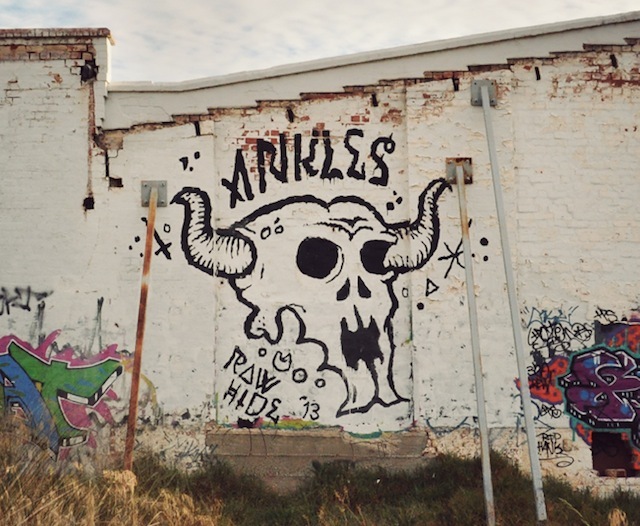 And Husk Mit Navn is an absolutely fantastic and underrated artist (check out some of his work here) who also has a lot to say about how his work is perceived in galleries, on the street, and online. Good stuff. You can pick up a copy of VNA 22 here. 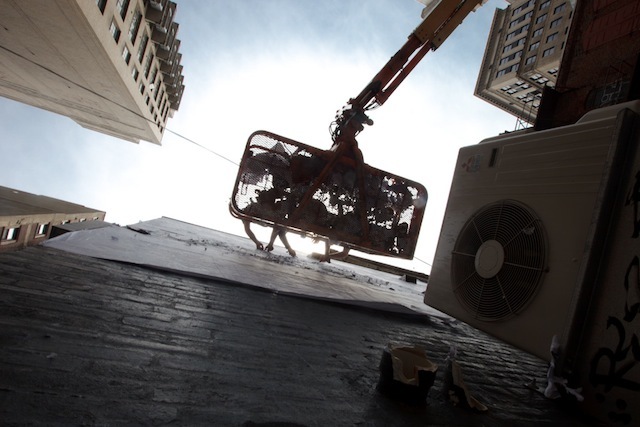 Vhils (aka Alexandre Farto) is here in Australia. 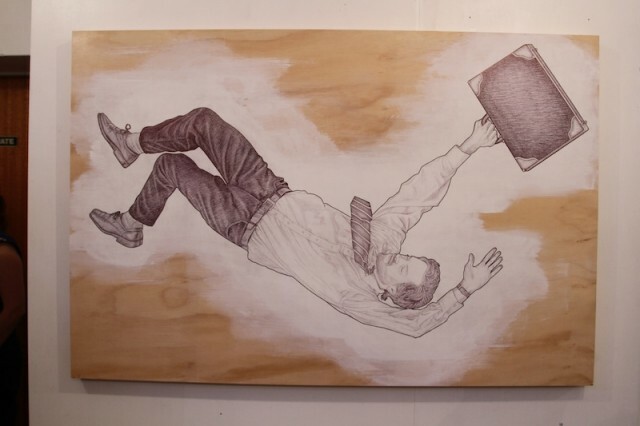 Sadly (for me anyway) he’s up north in Sydney, so I won’t get to see him or his new show, “Dissolve” presented by Skalitzers Art opening tomorrow on the 21st of March. I DID however manage to get a really great interview with him (via email) over on invurt. Definitely worth a read. 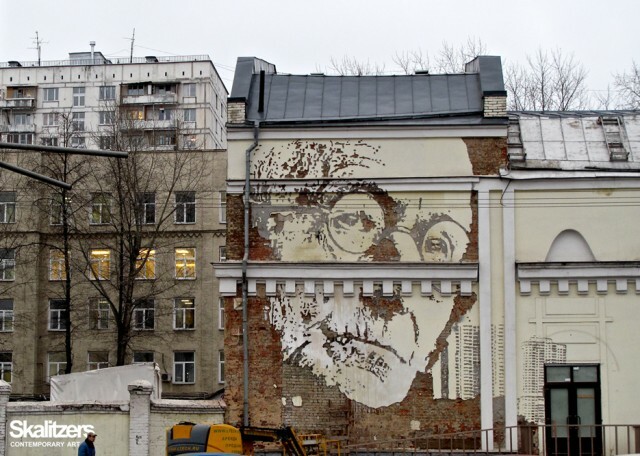 For me, Vhils brings a different angle to street art. 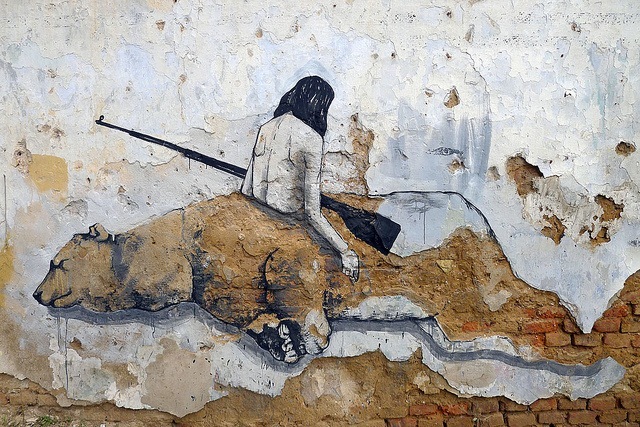 His chiseled walls and sculptured realistic characters bring a depth and feel to street art that I really appreciate. 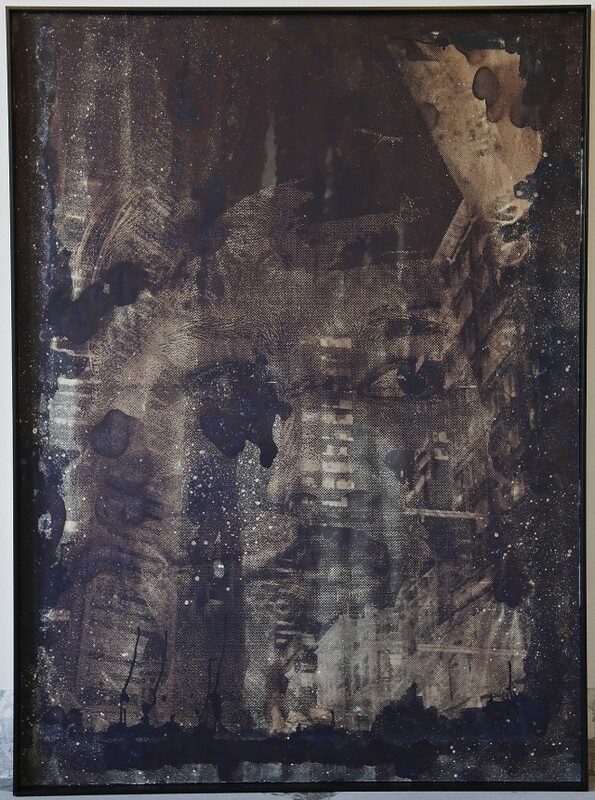 I also love different techniques, tools and textures so Vhils ticks all of the boxes for me. 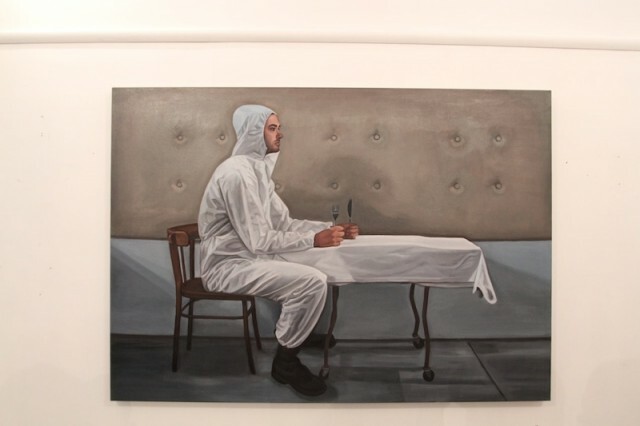 The show opens today (March 21st) and runs through to the 6th of March at 140 George St, The Rocks, West Circular Quay, Sydney. Facebook event page here. I’m a huge fan of Vhils’ work so it makes it even harder not being able to see the show. Some of the preview photos look very exciting. Check them out below. Sorry I missed the link-o-rama last week. Was having a fantastic birthday in NYC. Thanks to everyone who came out to say hello. I just picked up the recent Troy Lovegates book (now sold out), and I wish I could pick up this print as well. Absolutely beautiful stuff. Nice little Pink Floyd-themed stencil by Plastic Jesus. Interesting JR-esque posters in UK mines. Judith Supine on being bored with street art. Leon Reid IV’s latest sculpture addresses the crushing personal debt of so many Americans. 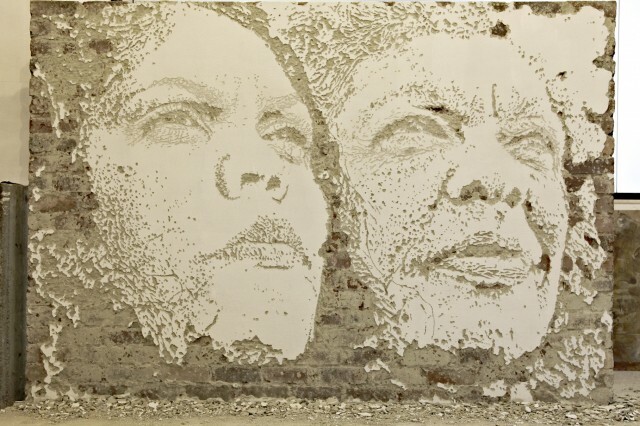 Tova Lobatz curated a show at 941 Geary with Vhils, How and Nosm, Sten and Lex, and others. Shepard Fairey released some prints using diamond dust, which is quite interesting. As the press release says, “Perhaps most famously used by Andy Warhol, who understood perfectly how to convey a message, Diamond Dust was used to add glamour, transforming ordinary images into coveted objects. The material aligns with Shepard’s work and interest in the seduction of advertising and consumerism. Diamond Dust, literally and metaphorically is superficial, applied to the surface of the print, the luminous effect is both beautiful and alluring.” But it’s one of those things that just gets me thinking about how the art world, much like capitalism, seems so good at absorbing critique and spitting at back out as product. People love the meaningless OBEY icon, so Shepard sells it. Shepard needs to make more product to continue selling to this market he has created, so he takes an old design (or a slight variant, I’m not positive), and adds meaningless diamond dust to it and sells it as something new. The best critiques participate in the system which they critique, but that’s a risky game to play. Of course, I say all this with a print by Shepard hanging on my wall. 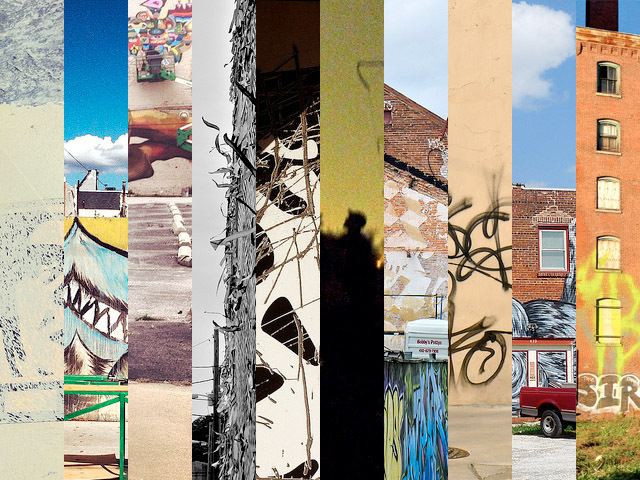 OldWalls is a project where the photographer took photos of graffiti in the early 1990’s and recently returned to those spots to take the exact same shots, and then each matching photo is displayed next to its counterpart. A classic Richard Hambleton print. He wheatpasted this self-portrait on the streets of New York in the early 1980’s.